Leaflets containing the booklists and other promotional material are available from our online shop. You can order leaflets containing the booklists and other promotional material from our online shop. 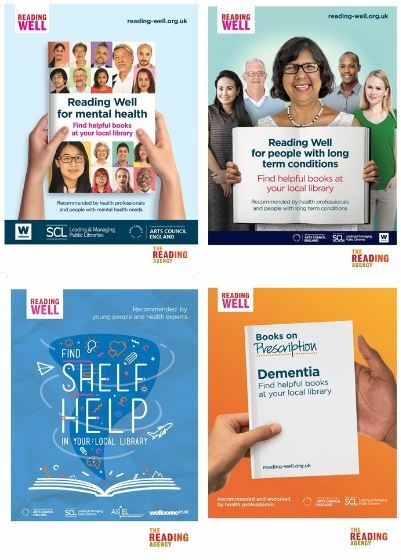 Reading Well user leaflets provide the full booklist, information about other resources available in libraries, useful links and signposting to other sources of support. You can also get in touch with your local library authority health lead as public libraries are always looking for ways to promote the scheme, and can share promotional material, leaflets, and posters for the scheme with local organisations. It’s worth contacting these local library contacts, or the local library in your area, and discussing ways you can work together to promote and deliver the scheme. If you’d like to be put in touch with someone from your local library service, email readingwell@readingagency.org.uk.